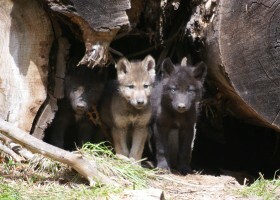 Wenaha pups in 2012 (photo by ODFW). Maintaining federal protection for wolves re-colonizing areas of the West is likely one of the most important elements to the scientifically defensible recovery of this species. Unfortunately, the US Fish and Wildlife Service (USFWS) is currently proposing to strip critical federal protections across all of the lower 48 states. As the wolf is both an iconic symbol symbol of that which is truly wild and is an important keystone predator, Cascadia Wildlands and our partners in wolf conservation strongly oppose any action to declare western wolf recovery “mission accomplished.” We would ask the USFWS to examine the calamitous post-delisting population trends in the Northern Rockies — including wolves killed from the Yellowstone population — and understand the implications of this action for western wolf recovery. Put simply, how can the USFWS justifiably de-list wolves in the Pacific Northwest and across the lower 48, if they know that this action is likely to reverse the current recovery trends of the animal? 2013: Thank you for being part of the chorus of over one-million Americans who, by the end of December 2013, encouraged the Obama administration to maintain critical protections for gray wolves. You were the voice of the voiceless. Because of you, wolves won. 2019: Unfortunately, on March 15, 2019, the US Fish and Wildlife Service published a rule proposing to prematurely remove gray wolves across the lower 48 from the Endangered Species Act. Learn more about the threat to federal protections for wolves and take action HERE.